The first time I rode a bike from Hebbal to Nandi hills in Sep 06, with almost no clue even about the distance from Hebbal to Nandi. Between then and now, I have biked from Hebbal to Nandi a no. 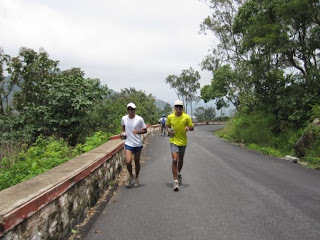 of times, ran up the hills from the Base quite regularly. There was just one more tribute to pay to the “Bull in Bengaluru’s Backyard”– run from Bangalore to Nandi. 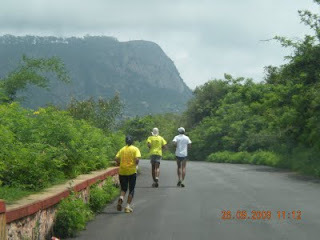 I toyed with the idea & the options available for sometime – take a bus, run downhill and then all the way back to Hebbal. 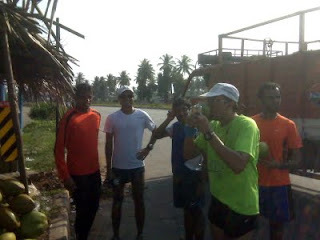 The other option was to start from Hebbal and run up to the hill. There are also various other non-highway routes that could be taken. 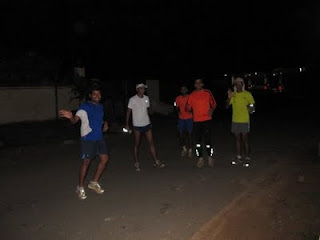 I finally settled on running from Hebbal along the NH7 towards Devanahalli keeping to the NH & the SH to the Base. It offered easy quitting options (hop on to a bus) in case something went wrong & it is littered with shops all along if we needed a drink or so. The support team: Tima, Giri, Mahesh’s driver. Tima (Sorry Chandra, its not Tina!!) volunteered to drive his car and act as a mobile water stop for us. 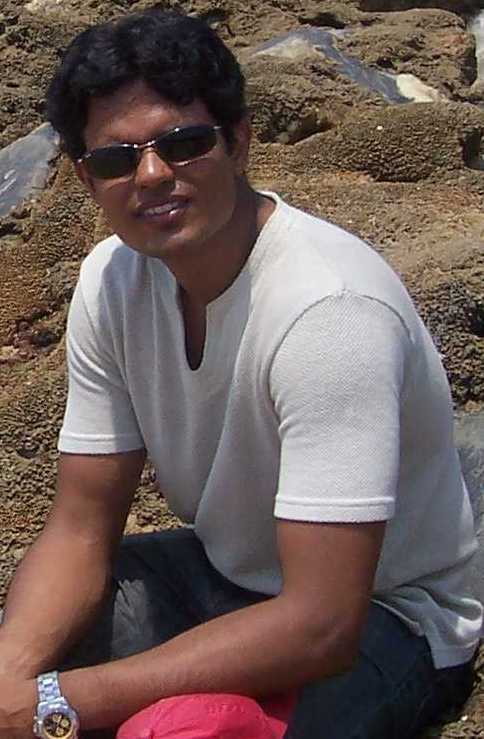 Mahesh’s driver also got into the act, putting his head out of the car and checking if we were fine as he drove past us. Chasing the Bull: Nari, Vasu, Chandra, Athreya & I started from Columbia Asia hospital at 5:20am, after a delay in scouting for a place to park. We eventually parked inside Esteem Mall. We were immediately passed by Monica & her friends who were biking to Nandi. She was kind enough to take this pic for us. 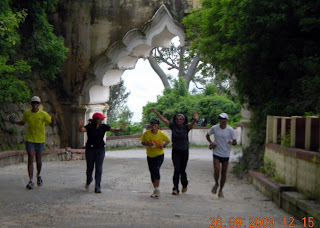 And so, we started running… keeping steady pace of about 9-10kmph. Mahesh spotted us near the Yelahanka junction and he joined us ahead of plan near the Jakkur airforce station. 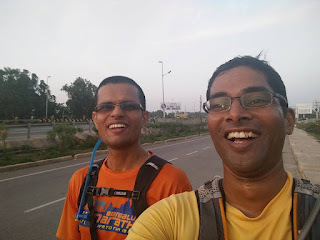 We ran the last 3.5k in 25mins at nearly 7min per km, which goes to show we did finish pretty strong, considering that the ascent was the steepest in this section of about 250mts!! 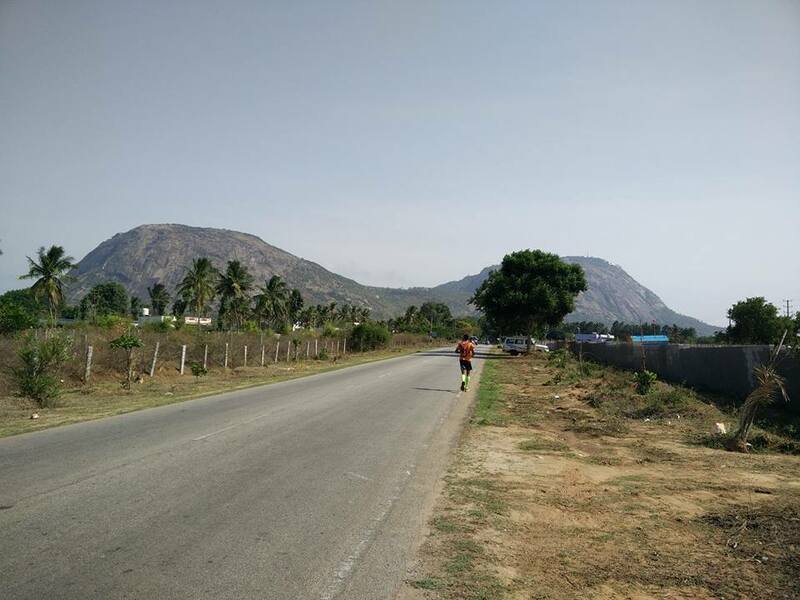 So, that is your benchmark for the “Chasing the Bull” Ultra – 51k in 6:57hrs. 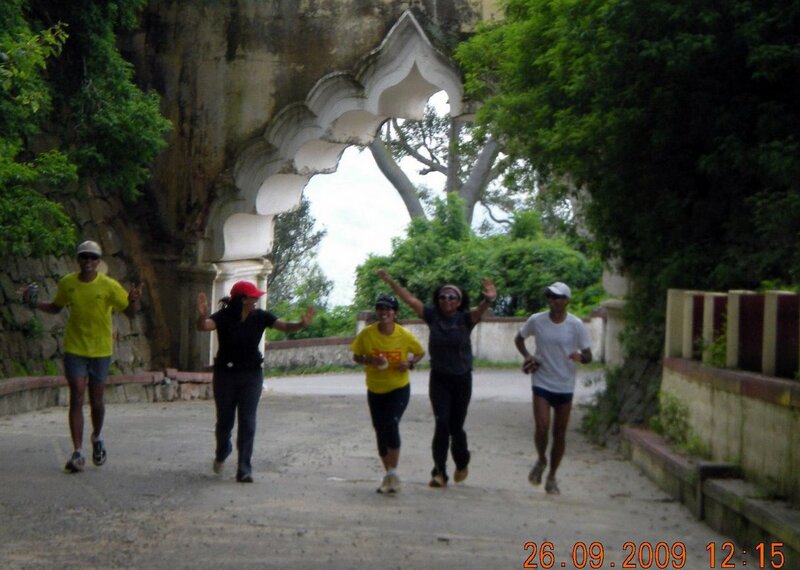 Many thanks to all the runners from BHUKMP – Vasu, Nari & Giri, to Mahesh, Athreya, Reena, Anjana & Anita. Big hug and thanks (in XXXL size) to Tima for the support. I had to overcome a huge urge to hug and kiss the 1k milestone as we were running up the hill and just that was worth all the effort!! Athreya was kind enough to present tee shirts to finishers (him n me!!) and Reena had organized beer and lunch at the Silver Oak Farm. Did a near repeat of this, ran from home (add 4-5km), minus support (self supported), replace Ath with Navin. Finished the distance in about 6h:45min, started at 4:45ish, finished by 11:30.
good effort to all you guys man! !